Those who believe an unfathomable experiential chasm exists between the West and the East would do well to consult Olivier Föllmi's photographs. In this remarkable collection, Föllmi demonstrates that the distance between cultures, no matter how great physically, is one of perception only. 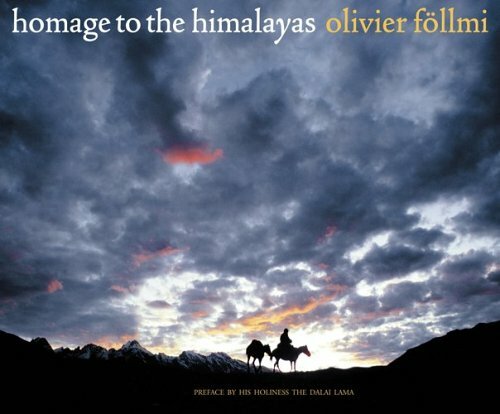 Once the official photographer of the Dalai Lama, Föllmi has been training his lens on the Himalayas for more than 25 years. Here he captures the essence of the region and its people as no one else could-its dizzying peaks, treacherous climate, and spiritual serenity. Images of Buddhist holy places are counterposed with portraits of ordinary people, their ruddy faces worn to leather by snow and wind. This is a breathtaking collection by a great artist whose subject is nothing less than our shared humanity.